J Hus made a surprise appearance on stage with Drake at London's O2, four months after being jailed for carrying a knife.The rapper was sentenced to eight months behind bars in December after he was caught with the weapon at Westfield Shopping Centre in east London.He's served less than half of that. "We're about to celebrate one of our brothers tonight", Drake told the crowd, before the words "welcome home" appeared on the stage floor. "I've missed you so much, I swear I missed you so much," said J Hus as he joined Drake on stage. "I waited for this all week so I could give you this stage so you can do exactly what you've been waiting to do," said Drake.The day after the performance, J Hus shared a video thanking Drake and showing parts of the show and footage of him reuniting with friends. It is not yet known when J Hus was released from prison - but it has been suggested it may have been the same day as the O2 performance.However, some people have questioned whether J Hus should be "celebrated" following numerous stabbings in the UK this year. 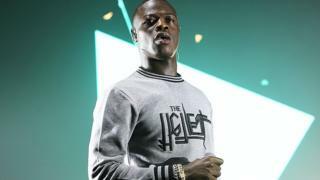 J Hus - real name Momodou Jallow - was jailed on 14 December 2018 after admitting carrying a knife in a public place.Judge Sandy Canavan told the rapper that he was a "role model to many" but "failed" to leave his past behind him. "This, in such a young life, is the fourth occasion when you have gone out armed with a knife," she said.After previous arrests J Hus said the reason he carried a knife was fear. Following the gig, Drake shared a photo of the pair hugging on his Instagram, saying that his 5 April show had a "different energy" because of J Hus's appearance and that people were "truly all so happy" to see him home. J Hus shared Drake's photo - as well as a photo from his management team - on his Instagram story. Radio 1 and 1Xtra's Tiffany Calver, who has been supporting Drake at his O2 shows, tweeted a photo of her and J Hus backstage at the show, repeating Drake's "welcome home" message from the performance. Will and Libby, a couple who were at the show, tell Newsbeat the atmosphere was "unreal. ""We didn't realise J Hus was going to be there, loads of people were saying Giggs was going to be there," said Will. "It absolutely kicked off. The crowd went wild, J Hus and Drake were hugging it out, everyone had a wicked time," added Libby. During his trial, the court heard J Hus, of Baldwin Drive, Peterborough, was in his car with his girlfriend - who was driving - when they were stopped by police officers after they smelt cannabis.When asked whether he was carrying anything he shouldn't, he revealed he was carrying a 10cm folding knife.During court hearings, J Hus apologised and said he "fully accepted his actions were careless. "He told the court that carrying the knife was "ill advised" and "utterly stupid", adding: "I was not in the right state of mind. ""I'm deeply sorry and regret my foolish actions."